If you have a chance, I highly recommend reading the blog that covered Andy Beal’s Google reputation presentation. Tons of great nuggets of information in his presentation in regards to doing reputation management for your company. However… don’t leave before you read this one on Advanced Keyword Research, of course! For those of you who think keyword research isn’t that important, think again. Keyword research is something that can make or break a campaign – paid or organic or even social. Let’s see what the panelist have to say about advanced keyword research. Ron will speak to us first, and he’s going to talk about the importance of keyword research, help us understand the role of keyword research and how it works with your different campaigns, the methods of his that work for any campaign, plus methods to score which will be your top performing keywords. 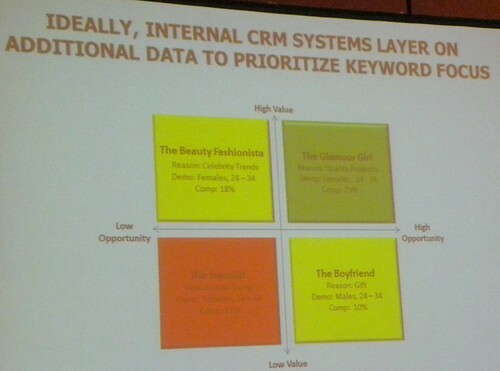 Keyword relevance across the board is vitally important. Keep your relevance across PPC, SEO and social so that it’s a constant flow and message to visitors and search engines. It’s important to know your audience. Speak the customer’s language rather than your own language. For example, if your company sells sofas (or what you call sofas), understand that your audience probably looks for couches. Simple things like that can make a big difference. How many terms should you target? That’s a great question that many people have. In SEO you need to think in terms of group or individual Web pages, not the whole site. 1-3 keywords to target per page is a good number. Make sure you use core or foundational keywords. 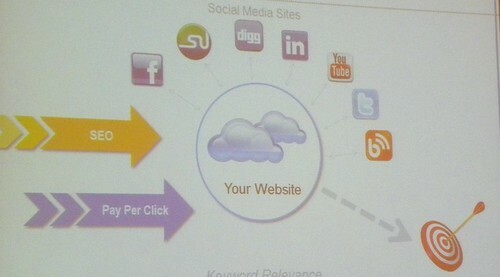 For PPC you can use as many as you want and can afford. And for social think in terms of conversation. Consider seasonality and trends too. Holidays, special events, seasons, economic trends are all things you should be thinking about when doing keyword research. Resources for finding an initial set of keywords could be just using a spreadsheet and brainstorming any possibility. You can always narrow that list down later. Look at pages on your own site for some initial ideas. Use brochures, your site search engine, company catalog, analytics, competitor sites, magazines and trade journals. Competitive analysis is a good resource because you can see what they’re doing and possibly identify gaps you may have missed. Also, don’t be afraid to go old-school and use a thesaurus. Social media and blogs may also be a good source of keywords. Social tags will give you insights, too. Remember to test and refine your words. PPC can be a great tool to test them. If you do PPC before SEO you’ll have the opportunity to refine your list before doing the SEO on your site, which could save you in the long run. Stacie will be up next to talk about some tools to help with the keyword research. Ideally, Stacie says to invest in a CRM system if the company has the money. You also want to know how your consumers spending time online. Again, Google Insights for Search is a good tool to look at when people are searching – seasonality. However, you should also look at when conversions are happening. Remember that consumers may search all year long but possibly only by during a certain time of year. Stacie uses Google Ad Planner to tell her what sites the target group uses frequently. To go hand in hand with that, you can use comScore to see what sites are also visited before and after a target site. Once Stacie goes through all this data, she creates a persona of a target segment. Like age, salary, martial status, education and living situation. This makes it easier for her to think of the consumer when selecting keywords. Moving onto Gap Analysis. Stacie recommends using word clouds to help further refine categories and structure. She mentions a site called Wordle that she loves. Then overlay your keyword research with actual conversion data. Once you do that you can map CPC’s with search volume to illustrate priority. As for ongoing maintenance, Stacie recommends monitoring constantly. She uses Google Insights because at the bottom there is an area that shows top searches and search volume. 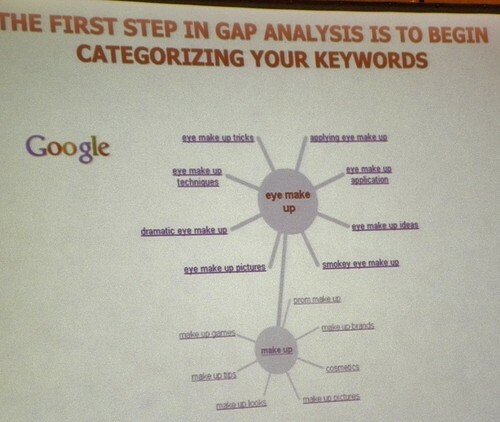 Also, use actual keyword performance from analytics or PPC reports. Then strategize between paid and natural listings so you understand where you need to have PPC to cover for lack of rankings. Aaron Lauper from Bing is up next. Flipping switches vs. adjusting dials is the first of the six core principles that he uses. He says that for PPC, it’s not necessarily about the longest list of keywords you’re bidding on, but actually “dialing” in on the right keywords. The second principle is planting seeds vs. gardening and weeding. Have a balance to not only do the research but to maintain your list. Total cost vs. cost per click is his third principle. If you have 100,000 keywords in an account but only 1,000 really work for you, that means that there are 99,000 that are costing you resources. It’s an optimizing issue, complexity issue and manageability issue that you need to consider. Ratio of landing pages: # of keywords is the fourth principle. It’s not a 1:1 ratio but could be a 1: infinity ratio. Your keywords should be relevant to the landing page and you don’t want to get to broad or off topic. Keep in mind that you can only stretch your keywords so much depending on your available landing pages. The fifth is words and user intent. You need to understand your user’s intent and your keywords need to reflect that. Look beyond just your words, but look at your users [refer to some of the notes from Stacie, and how she creates a persona for her users]. If you can capture your user’s intent you may come across some valuable keywords that will convert well. The sixth principle is the “Sandbox Performance View vs. the Holistic Performance View”. Test your keywords and then tidy up your list. 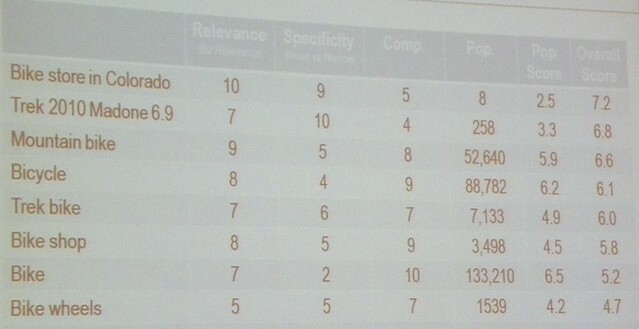 adCenter weighs keyword performance heavily when looking at the health of the account. It’s important to not keep that “dead wood” around. Test then tidy is what Aaron recommends. And to wrap up the session is Wister Walcott. He’s going to cover keyword tips and techniques for large scale PPC programs. Larger advertisers face unique problems, like the volume of keywords can make analysis and management difficult. Keyword building is a continuous process for positive and negative keywords. Quality score is a critical element in competitive marketplaces. After using negative keywords, you get 7,000 impressions, 210 clicks, average CTR of 3% and plus a conversion rate of 3%. The negative keywords can greatly improve your quality score and positioning of a PPC campaign. Yes, you’ll lose some impressions but the quality of visitor coming to your site will be a welcomed improvement over those just clicking and costing you money. I have found that the best place to begin your keyword research is on Google Search page one. Do a simple keyword search on Google using your keyword and instantly see what the SEO Pros are using in their titles and descriptions. I was just thinking about trying the PPC trick myself, taking a monster list, running it through PPC (with many ad varieties) long enough to get some performance comparisons, then use that to refine the SEO keyword list. I’ve always done it the other way around. Thanks for catching that! It should work now. Hi Bruce, the link to Google reputation presentation is not working “Sorry, Page Not Found”. I caught this one too. The adcenter tool was worth it alone. It’s actually an add-on for excel 2007 and it will populate keyword data right into your spreadsheet. Take that Google! Honestly, I really went to the session for advanced keyword research techniques and would have liked to hear more about that. But, I did learn a lot so I can’t complain. The SEO Lab on Wednesday covered using webmaster tools to identify “low hanging fruit” by highlighting keywords which you may rank on page two or three, simply add a few links, more targeted content and jump up to the top of the SERPs. The thing to remember is all of our keyword tools are only as good as the data provided. PPC tools usually include content network data too so those numbers will be much higher than what you would actually receive in organic search.